The original Wolfenstein 3D reimagined the first person shooter genre back in 1992. 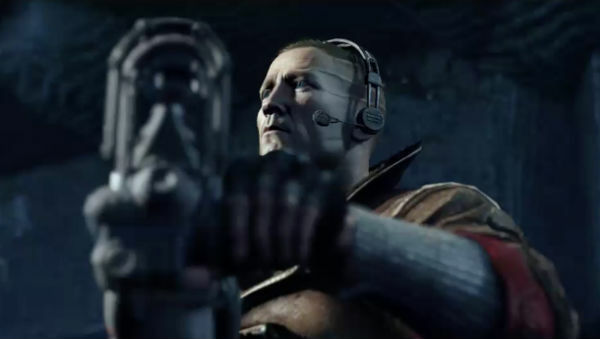 Now, more than twenty years after the original and a number of sub-par sequels, William “B.J.’ Blazkowicz returns to Germany with superb visuals, solid gameplay, and top notch story telling. The reboot of the franchise sees the world destroyed by the Nazis invasion, and no one to turn to. In comes B.J. with a hatred of Nazis that is now grounded in real life experiences for the character. The first and subsequent sequels in the Wolfenstien franchise, never gave B.J a strong personality. Of course he had attitude and grit, but what he was missing was emotion and a passion for killing. The prolong, which is one of the longest I have played in a game, gives you an underlying meaning behind why you are fighting. It also sets up a huge shocker for one of the last boss fights in the game. After the prolong, B.J. is for all intense and purposes paralyzed for almost 15 years. While in a mental hospital, you begin to understand more of why and for whom he is fighting the Nazis. Although The New Order thrust you into the 1960’s with giant-mechs and robot guards, a lot of the story is grounded in real life scenarios that could have been actualities if Germany was able to conquer the world. Attacks on mental hospitals, gruesome interrogations and wide spread holocausts makes you feel that this is a world set in Nazis Germany. When it comes down to gameplay, The New Order is a fast paced thrill-ride full with tough encounters and epic boss fights. You can double-wield any weapon, which really changes how you might go about attacking a particular section in the game. You have to really plan on which guns work the best against certain troops and which ones do not. What I did find rather frustrating was changing weapons, which could be rather bothersome in encounters that pit you against multiple foes. Another irritating aspect I found was that some encounters were very difficult You have to pick your way through the Nazis strategically. I was playing on Hard, but when most of the game you are running from scene to scene without a hitch, the slow down in pace due to difficulty was disruptive. That being said, the satisfaction of getting through hard bosses or difficult sections really made you feel like B.J. was one bad mother. In a homage to classic shooters, The New Order has epic boss fights. In order to take down a gigantic robot for example, you may have to take out its rocket launcher first before trying to take out its engine. There are also some more minor troop encounters that are multistage. These encounters really have you on your toes thinking about what you should do rather than just blasting your way through round after round. 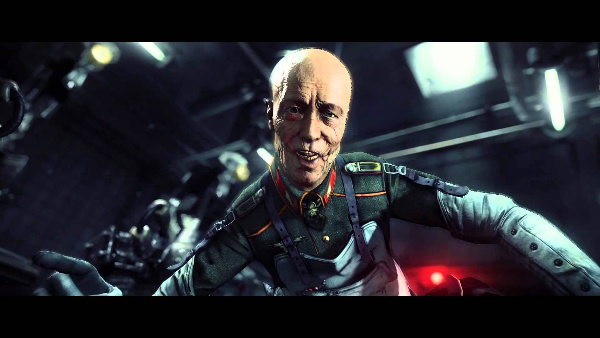 The main antagonist themselves, Frau Engel and General Deathshead, are some of the most memorable characters I have seen in a game. There is a level of hatred that you place on these two characters, that you normally would only have for real world enemies. From there despicable actions, to there grotesque features, they are crafted with intentions to have the gamer hate them and they did not disappoint. Likewise the exact opposite can be said of your allies. You instantly get the protective but firm mother aspect from Caroline Becker, head of the resistance, and a friendship bound with ‘J’ that last till the end of the game. These characters feel incredibly real and cut-scenes that play out like scenes from Ocean’s Eleven really draw you in and make you apart of the experience. Another nice touch to the game is the ability to gain upgrades for B.J. through the perk system. More knives to throw, increased reload speed and extra grenades, not only entice you to try every weapon but add another layer of entertainment for replay value. One of the cooler weapons in the game is the LaserKraftWerk. Through upgrades during the game, it becomes a very powerful weapon and helps eliminate armor heavy Nazis. Not only does it give you a stronger weapon, but you also have to recharge it, which adds a difficulty and layer of depth. Much like the gravity gun in Haf-Life 2, the laser doubles as a weapon a way to get through puzzles. I could harp on the weapon changing or lack of online play in The New Order, but then again I would be missing the finer points of a great game. The level design is top notch and the verity of gameplay is also to be commended. You may want to blast your way through Nazis double wielding an assault rifle, but some areas give you the opportunity to stealth kill your foes in dramatic fashion. What really sets The New Order apart from previous installments and other first person shooters is the immersive story and impactful characters. The world really comes to life in the dialogue, which gives you the feeling that you are in a war. The story was so cleverly created that from the first chapter to the last, surprises are around every turn and jaw-dropping realities stitch everything together perfectly. Finally after six months of sub par Live titles I can finally hands down recommend a Live game without any doubts. If you are looking for shooter to add to your collection look no further then Return to Castle Wolfenstein.